Let us say that my sampling rate is 1000 Hz. This enables me to accurately capture every frequency in the 0-500 Hz range according to the Sampling Theorem using a DFT. However, there are higher frequencies present in the signal in between 1500-2500 Hz. If I am to convert the 1000 Hz data to its DFT, I understand I will not get the higher frequencies. However, I only care about the lower frequencies. So my question is, will I accurately get the lower frequencies of the signal and their precise amplitudes using the DFT? If there are higher frequencies present in the signal you will indeed get all these! The problem is the frequency components will be aliased as additional signals also within your first Nyquist zone of 0-500 Hz (assuming a real signal, if complex then the full 0 to 1000 Hz spectrum in the DFT will be unique). To uniquely observe the signals that are in the 0-500 Hz frequency range, you MUST have an anti-alias filter in the analog domain prior to the sampling of the signal at 1000 Hz. Ideally (but not achievable) you would use a "brick-wall" filter to pass the DC-500Hz band with no distortion or loss, and then completely reject everything above 500 Hz. Welcome to the real world, where filters have finite impulse responses and we don't have forever to wait for long filter delays-- meaning we must have a transition band in the design of these filters. The amount of effort and cost you want to put into the anti-alias filter dictates how much of the DC-500 Hz band you can reliably observe, and really goes into a lot of consideration in the overall system design (trading design detail elsewhere). A typical number can be 35-40% (35% Meaning DC-350 Hz passband, 650 Hz + stop band.). Now if your goal is to instead observe the spectrum that is present in the 1500 - 2500 Hz frequency band, you could instead design band pass anti-alias solutions to select them specifically prior to sampling with the same 1000 Hz sampling clock (this is called "under-sampling). In this case you have restricted what will alias into the DC-500 Hz band, and can therefore uniquely identify the actual frequency components from mapping the aliasing. Like above, if it is a real signal and you are restricted to the 1000 Hz sampling rate, then 350 MHz bandwidths would be reasonable for the bandpass filter, meaning you would not be able to observe with one DFT the full 1500-2500 Hz analog spectrum with a real sampling rate of 1000 Hz. 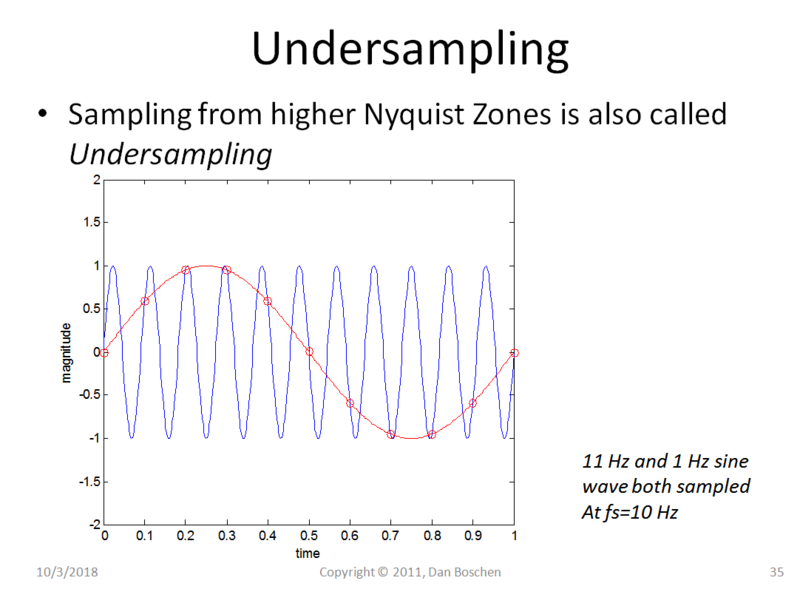 Undersampling is best demonstrated with the graphic below showing two analog signals, an 11 Hz sine wave and a 1 Hz sine wave both sampled with a 10 Hz sampling clock. Once sampled we will only have the red circles representing the signal. This shows that the input in this case could have been either the 11 Hz or the 1 Hz signal, and if no filtering was present to restrict one from being possible, we would have no way to distinguish which signal was present. If both are present then they could destructively or constructively interfere depending on their relative phase. Not the answer you're looking for? Browse other questions tagged fft sampling dft or ask your own question. Analysing 2500 frequencies using FFT with an input vector of 2048 samples? How to do the highest resolution FFT? How does zero-padding affect the magnitude of the DFT?